If Bill Shorten wants to leave a lasting legacy and secure like Gough Whitlam his place in history – he needs to take his inspiration from Australia’s most progressive prime minister. No prime minister changed Australia more than Gough Whitlam; and that he did it in less than three years has never been forgotten by the backward-looking Ruling Rabble. In a flurry of activity, Whitlam established universal healthcare, effectively nationalised higher education with free tuition, and massively increased public-sector salaries. He enacted an ambitious cultural agenda that has continued to shape Australia until 2013, when Bookshelves Brandis and more recently, Fifi Fifield have proceeded to gut cultural and communication funding by paying their Ugly American Piper from the public purse. In just three years, Australia was given a new national anthem, ditched the British honours system, and abolished the death penalty and national service. He was the first Australian prime minister (and ahead of the Americans) to visit communist China and he granted independence to Papua New Guinea. Whitlam also passed the Racial Discrimination Act and introduced no-fault divorce. In short, Whitlam brought Australia into the C20th: but the present Ruling Rabble under the aegis of The-Coots-With-Queer-Ideas-From-a-Parallel-Universe (IPA) and their secret promoters have since 1975 been desperate and, in some cases successful, in dismantling his legacy and attempting to turn Australia back into a cringing neo-liberal backwater of cultural forelock-tugging and a land of increasing wealth polarity at the mercy of a failing capitalist “market economy”. It’s Time to redress the balance. For Australians to aspire to something higher than base greed posing as “aspiration”, cupidity, division, fear and racism. And all happily paraphrased and misquoted from the IPA handbook on destroying Australia: circa 2012. 1. Re-Introduce the price on carbon. Re-fund The Clean Energy Finance Corp and all Climate Change bodies as a priority, ensuring Australia is, by re-allocating subsidies to fossil fuel polluters, specifically the Diesel Rebate, modernising its generation systems. Increase the Renewable Energy Target to more realistically meet Australia’s commitment to a cleaner world. 2. Set up an ICAC with teeth. 3. Re-nationalise Centrelink, and re-think 457 requirements to advantage Australian citizens. Re-nationalise Telstra and all Electricity services or fund community decentralised grids of mixed wind, solar, hydro and battery storage. g) the Australian Federal Police, specifically its political bias. 5. Abolish all but “per head” flat rate funding to private/public schools and remove religious chaplains from public schools. Abolish university fees for Australian citizens and expand TAFE. 6. Cancel purchase of the F-35 and re-negotiate orders of foreign built submarines and vessels. Compulsorily acquire Ford ,General Motors and Toyota manufacturing plants and convert to manufacture of electric/hydrogen vehicles and other public/military transport needs. 7. Gradual repeal of Negative Gearing. 8. Stricter media guidelines and strengthen Press Council sanctions for false / deliberately inaccurate statements . 9. Increase funding for the ABC/Arts bodies/Screen Australia, restore funding to National Library and the National Archives. Remove present ABC MD and other IPA affiliated staff and board members. 10. Rescind commissions of Ambassador to US and UK High Commissioner and replace with career diplomatic corps. 11. Abolish the ABCC and restructure the “Fair Work Commission” replacing those political appointments made since 2013. 12. Close Manus and Nauru concentration camps, relocate refugees to Australia, review the excesses of Border Force and security operations. There ya go. Not as all encompassing as the IPA’s original 75 Things Rabid the Hun must do to destroy civil society in Australia, quickly expanded (from their spurious “research”) and their foetid minds to 100 points … but a start in redressing the appalling career to the far-right and fascism Australia is currently undergoing. This article was originally published on Shane Wombat’s Droppings. I would like to add to this list that they also need to directly tackle violence against women especially domestic violence. No more lip service followed by funding cuts. Seems a bit like “draining the Australian swamp”? I just hope Labour can restrain their ministers, advisers and staffers to be a bit more ethical and self-disciplined than the current Australian Government franchise holder? All of the above – plus what Aradia said – but I would implore them to also fix up the NBN stuff-up that Turnbull has dumped on us. Sadly, it will take a long time and cost a motza. Also, they need to arrest, try and convict Dutton for crimes against humanity! They also need to review any deportations that he has ordered and possibly compensate anybody who was unfairly deported. @4f … require all irrigators to install satellite pump meters on all pumps taking water from the Murray Darling (MD) system and impose “terribulous” fines for water theft including suspension of licence privileges for water thieves of all persuasions. Then deal with the “Cubbie Station Syndrome” where all the water falling on the property stays on the property in large dams that lose considerable water by evaporation. This will require modification to the now established 3m high earth wall barriers around too many NW NSW and S Qld properties that disrupt the natural flow of flood waters into the MD river system. @5 … return to the pre-1963 situation whereby private schools were only privately funded and return the now subsidy savings to the state schools system. There is no need for a parallel private school administration bureaucracy funded by the state. Plus there are now few, if any, religious in Orders and or in schools providing a second rate child-minding service for the faithful. A Royal Commission into the NBN. Specifically the doggey advice and how they got the project so wrong. Great stuff – bring it on! The progressive side of politics really has to toughen up and take conservatism on full in the face and when needed, make it painful and make it hurt. Today’s right wingers are spoliing for a fight in every policy area so it’s time they were given one, two, three and more big hits. Bugger being nice, bigger being fair, they don’t understand it and they don’t practice it. Shorten could learn how to bluster and blather when door stopped and/or walking into a ‘gotcha’ moment. The Coalition endlessly repeat quotes from Shorten and Bowen and Albanese. I don’t know why Labor never throw a few back at Malcolm. Like this one…. “How often do we hear Australian politicians discuss these challenges in a genuinely open, honest, spin-free and non-adversarial way? Where the intention is to clearly explain the problem, accept responsibility for past misteps if appropriate (rather than apportion as much blame as possible to the other side), allow a non-ideological discussion of possible remedies, and see if there is any common ground for bipartisan work? Most Australians believe we need an honest, informed policy debate. Yet I don‟t see many people who believe we have that. Instead, we all hear again and again that Australians are ashamed of the parliament, that they see it as nothing more than a forum for abuse, catcalling and spin. Bill Shorten is not, and never will be, another Gough Whitlam. The list above, with additions, is a good to-do list, to which I would add repealing some of the legislation which has given so much power to our intelligence agencies, AFP etc., and in doing so curbed our freedoms and rights to privacy. It is time Labor started to ridicule the more outrageous government claims of threats to our security and point out how we have, through blunders like Iraq and Afghanistan, made ourselves less safe, though not as threatened as they would have us believe. However on this subject I don’t hold out too much hope given that Labor has waved through almost all of the bills so far, not only for fear of being wedged as soft on security but also because, in government THEY would be the beneficiaries of the increased surveillance. Finally, I have only recently noticed another job handed out by the government to someone for being a dud. I refer to the new legal eagle woman who has triggered the latest attack on Bernard Collaery and Witness K, who as lead counsel in the Trade Unions Royal Commission, failed to lay a glove on Labor and only gave bill a tickle. I would add creating a government administered bank for farmers and first home buyers, removing negative gearing and creating a aboriginal ministry run by and for our first people.It would inform parliament on any issue to do with land use, land care and environmental and cultural issues. Throw in a ministry for women too so we can legislate better equality and stamp out all forms of domestic violence. By the way, no defence force who knows their stuff are thinking about manned ships, subs or planes for the future. Only backward looking or corrupt advisers would ever agree to develop such old-school equipment. If our defence forces can really justify spending on defensive equipment, it should be all remote vehicles. And Australia needs a bill of human rights that ensures that all people have rights to live and be treated decently. You seem to have ignored the struggle of women to be free of all forms of male exploitation, discrimination and violence. This is ironic considering you have used Whitlam as a benchmark and he did more for women than any man before or after him. Are you guys a bit out of touch? Not the most encouraging start? The only thing shorten has in common with Gough is his height. It may possible labor will emulate the years from ’49 to ‘it’s time’ but I hope the ‘coloured’ DLP clo(w)nes are less effective this time around. But nothing will happen with osmosis it will take giving the morning shows something to as the lnp and whatever will need to be repeated till we all can learn it. after bill and benalbo and tax gaffs. I have bought a box of tissues for the by elections. So much to be done. But first Labor has to get past the screaming headlines and endless regurgitating of the “slipup”. Even Andrew Bolt described it as “rare”. But media has gone mad over it. InsidersABC panel of Coorey, Crowe and Savva (theres an unbalanced lot if ever there was) chewed it over endlessly. Ignored all the civil liberties the government has been introducing. The news that Duttons expenditure is secret, and will not be published. 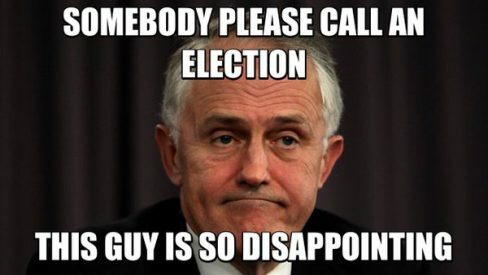 You cant blame Labor for not chucking things back to Turnbull. They almost certainly do, but media ignore it. ABC cuts Bill Shorten off during an “on fire” speech today. Yet SkyNews saw fit to play the speech in its entirety. Thats a bit of a change. Stop logging old growth forest. Labor opposed tax cuts for businesses. Emma Alberici and other people knowledgeable about the failure “trickle down” said there is no evidence of its success. Let us have a real investigation into the Coalitions claims. This would match the Coalition strategy of continually claiming “there are questions to be asked’. They offer this nonsense about Climate Change, accusations against Shorten and Gillard even after days of interrogation in a Royal Commission…and there are others. A worthy list and many more good ones from the many commentors. Unwind the last 30 years of neoliberalism. We do not need another progressive neoliberal government to replace a conservative neoliberal government. Full employment policies with appropriate fiscal policy, policies to develop a relatively self sufficient environmentally sustainable economy and a national job guarantee program. Progressive taxation, and end to tax evasion and a comprehensive social welfare system to greatly reduce disadvantage and inequality. Amend all FTA’s so that we can retain a manufacturing and associated services sector. Introduce import tariffs where needed and an economic development organisation like Japan’s Ministry of Economy, Trade and Industry focused on developing a sustainable economy. A state owned major bank and removal of any government guarantee for the commercial banks. Renationalise all worthy utilities and publicly used infrastructure. Protect and restore our natural environment. No drilling in the Great Australian Bight would be excellent.